When my friend and I decided to embark on a weekend adventure to the city of Morden, we didn’t know we’d be hatching our very own fairy tale. The fact that we were going anywhere at all was a fable in itself because we’d left behind a sum total of four kids under the age of six and two husbands behind, and if you’re a mom, you know how rare and unlikely a tale a night off can be. So I suppose it’s fitting that not only were we getting away, we were doing it in a setting that even Cinderella herself would approve of. While it’s not often one travels to a place solely for the accommodation, I’d urge you to reconsider that when faced with Bella’s Castle Bed & Breakfast. 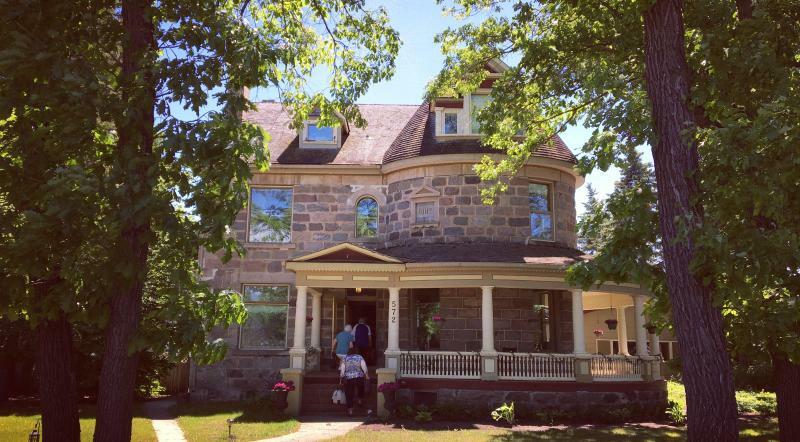 This unbelievably charming historic home, turned B&B, is just about the loveliest spot you could ever rest your head. Owner Lily and her family were charming, welcoming and made for great conversation sitting peacefully on the wraparound porch on the warm summer eve. There are four bedrooms on the second floor–the standout of course being the honeymoon suite with its majestic canopy bed (fit for any queen) and the stone wall room, which was built on the outside of the house once upon a time and boasts the rustic feature wall making you feel just like you are inside a bonafide castle. The enormous Jacuzzi inside the regal bathroom (did you know that a bathroom could even be regal) was also noteworthy. One of the B&B’s best features was the front porch where me and my fellow queen whiled away many hours sipping rose and watching the quiet street in front of us. As the sun set, twinkle lights on the house only added to the dream like feeling of this place. For dinner that night, we picked up take out from Dos Banderas, where the house made flour tortillas were a standout. Fresh and flavourful, they paired perfectly with grilled chicken and peppers in fajitas and with cheese and shredded beef in enchiladas. On our second day, we were treated to breakfast at our castle complete with locally made sausage from sister city Winkler. Lunch featured a spectacular view of the golf course at McGee’s with fruity drinks and prairie classics like a Mennonite poutine–just like a regular poutine but with the scrumptious addition of fried onions and white gravy–as well as the ‘pound of perogies’ which turned out to be a pile of the cutest mini perogies filled with cheddar and potato, served with sour cream. It turns out Bella’s Castle is just one of numerous beautiful homes that grace the city of Morden. Everywhere we turned, historic buildings, turrets and stunning architecture greeted us. A quaint and adorable church worthy of any town square was flanked by the prettiest yoga studio I’ve ever seen, as well as an adorable former barn turned trendy quilting shop (yes, quilting is trendy, where have you been?). Across the street from our B&B stood my dream house. It was all I could do not to imagine Rapunzel letting down her hair from the top of the home’s impressive tower. Upon our arrival in Morden, we discovered their annual Block Party was underway in downtown, meaning the streets were bustling with people, music and fanfare. We skirted past the kid’s zone with its bouncy castles (more castles!) and games and gave a nod to the parents enjoying their brethren that Saturday. We moved on, however, to take in things like a strong man and woman competition, some entertainment wrestling and lines and lines of vintage and souped-up cars. We thought that maybe next year we’d send our husbands for a dad’s weekend to take in the revving engines and very loud burn out competition that afternoon. Dads need time away too, amirite? Of course, a day as a queen isn’t complete with out a little pampering. To start: shopping. One of our stops included Marni LuHu Designs, an eclectic and completely adorable shop featuring decor items, kitchenware, baby gifts, locally made jewellery and even gourmet food products. We could have spent half the day discovering the quaint and cute collection of wares housed inside this funky space. Next we headed over to Pure Anada’s boutique on Stephen Street. This local success story features Morden’s very own brand of skin care, hair care and makeup, all made by hand right in the back of the shop using only the most naturally derived ingredients. We were treated to makeovers by Kristin of Tin Feather Cosmetics who also boasts her own line of locally made lipsticks (I went home with a hot pink tube of the colour Vintage). After our makeovers, we headed back to our B&B where we were treated to a luxurious deep tissue and hot stone massage by Bella’s Castle’s own massage therapist. It was pure bliss for these two queens. Every castle needs a forest and moat somewhere near by. In our case, those came by heading out toward Morden’s golf course for a stroll along the Kinsmen Footpath. This casual sauntering walk took us past the greens, through some forest canopy and put us at Lake Minnewasta Beach. Being fairly early in the morning, the shores were still quiet, but we could already see the families trickling in for a day of fun in the sand. The beach itself would be the perfect day trip for families with little ones, because the enclosed and relatively small space would mean no one could wander too far off. And while this moat didn’t have a dragon (that we know of), we couldn’t help but be moved by the incredible surroundings and perfect blue sky so characteristic of Manitoba. Finally, our adventure in Morden couldn’t be complete with a visit to the Back 40 Folk Festival. They bill themselves as the ‘greatest small festival experience’ and we couldn’t agree more. There is a natural bowl inside Morden Park where the stage is situated making for an intimate and comfortable gathering of music lovers. Bring a lawn chair or your favourite quilt early to secure a spot in front of the stage, and then wander among the artisan tents shopping for locally made jewelry, crafts and art. Grab a dish of creamy ice cream or a pulled pork on a bun from one of the food trucks and sit back and enjoy the sunshine. If you’ve got kids in tow, then Morden Park also boasts a great spray pad and several play structures just outside the festival fence.